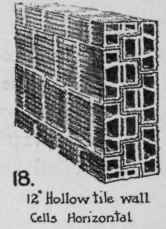 There are two types of hollow terra-cotta blocks, one which builds with cells vertically and the other which builds with cells horizontally. This latter is generally an interlocking tile. The strongest wall for vertical-load resistance is built with vertical-cell tiles. All hollow tile should be laid in Portland-cement mortar, and the webs should be arranged so that they build over one another. 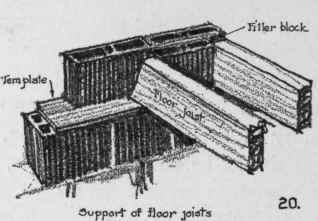 The bearing of floor beams and girders on walls, built with blocks of vertical cells, should be made by covering the tile with templates of terra-cotta slabs, filling them with concrete or protecting them with plates of steel. Where chases are required for pipes they should not be cut into the wall, but special blocks should be used to build around them. All lintels under 5 feet should be constructed with tile arches, reinforced with concrete and steel rods inside of their webs.